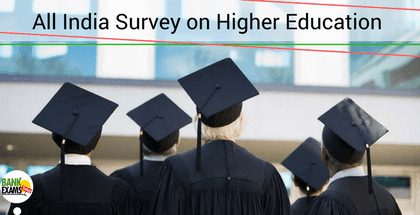 On January 5th 018, Prakash Javadekar, the Union Minister for Human Resource Development, released the final report of All India Survey on Higher Education (AISHE) for the year 2016-17. The enrolment by the end of the 2016-17 academic year stands at 3, 57, 05,905 with a Gross Enrolment Ratio (GER) of 25.2. Gross Enrollment Ratio has increased from 19.4 percent in 2010-11 to 25.2 percent in 2016-17. There is marginal improvement in number of foreign students -- 47,575 in 2016-17 from 45,424 in 2015-16 -- with 31,779 men and 15,796 women. Karnataka continues to lead the country with the highest number of foreign students choosing the state as their preferred destination in 2016-2017. The maximum number of foreign students in the country came from Nepal comprising 23.6 percent. This was followed by Afghanistan with 9.3 percent and Bhutan with 4.8 percent. The maximum number of foreign students enrolled for undergraduate courses which are 76.9 percent. The survey shows the Gender Parity Index increased to 0.94 in 2016-17 from 0.86 in 2010-11 with women participation in certain disciplines very high and increased sharply in courses like MA, MSc, and M Com. Women continue to outnumber men in bachelors of arts and education. In MBBS there are 99 women per 100 male students, up from 86 in 2012-13, and in B Com up to 93 from 79 in the same period. Even though the GER of the female is higher, there is still a significant gap in B.Tech, M. Tech, law and MBA programmes. In B.Tech, there are only 39 women per 100 men, hardly any improvement from 38 women in 2012-13.